This last week we ran our first ever challenge with Acraftability (our free Facebook accountability group for crafters)! 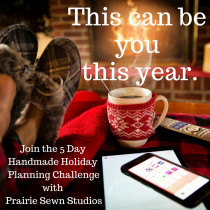 The goal of the challenge was to come away with a plan of action to make all your handmade holiday presents with joy and finished on time.I thought it would be fun to share to share some of the process I went through. I’m keeping the details purposefully vague as to not ruin the surprise! And that’s it! We have a lot going on during the next few months, and this gives me two big projects to focus on. Wall-hanging #1 is nothing more than an inspirational fabric, some coordinating colors and a vague pattern idea in my head. First item on my “Steps to Completion” list is finish design plan! Wall-hanging #2 is cut and partially pieced, so it’s a good bit further along. I’ve already decided how I’m going to quilt it (stitch in the ditch) and have my backing fabric chosen. For both of these projects I’m going to check my stash for batting. I think I have all the fabric I need and will shop the stash first if I need anything else. I’ve made a project box for each wall-hanging to keep all the supplies together and close at hand. Both of the wall hangings are for gifting on December 25, so I’ll need to plan ahead so that I’m not sewing on Christmas Eve. We have some pretty serious family Christmas Eve traditions involving Christmas Eve on Sesame Street and mandatory sugar cookie decorating, and it’s important I spend that time with my family instead of at my sewing machine. Handmade gifts were a big part of my life growing up, both during the winter holidays and for any other festive occasion. For me, making a handmade gift is a way to giving part of myself to someone that values the time, energy and creativity it took to create a unique and thoughtful gift. I also choose handmade projects that bring me joy in their own act of creation, so that each stitch is a gift unto myself. Did you miss the challenge? You can still sign up to get the daily emails and the workbook below! Don’t forget to join Acraftability to join our accountability community for crafters.